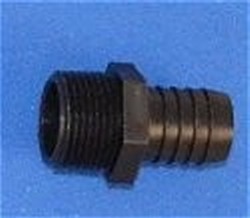 Polypropylene barb adapter. 3/4" Male Pipe Thread on one side and 3/4" barb on the other. Black in color. Polyethylene. Formerly known as PPN66.